One new festival and two established fairs: Vienna moves into spring 2019 with a whole bunch of art. Vienna has a new art festival: It's called Foto Wien and will be held every two years, for the first time from March 20 to April 20, 2019. The festival is organized by Kunst Haus Wien. Foto Wien focuses its attention on the medium of photography and reveals the variety and potential of the local photography scene. More than 120 program partners – museums, exhibition spaces, galleries, photographic institutions, art universities and off-spaces – take a new look at happenings in the world of photography in Austria and abroad during the four weeks of the festival. The festival headquarters are located at the Post Savings Bank in the 1st district. Several of the festival's own productions as well as workshops, discussions and symposia are scheduled to be held in the building designed by Otto Wagner. For example, Austrian and French artists deal with the phenomenon of the city in the exhibition "Zones Urbaines / Urbane Zonen" (Urban Zones). Around 35 Austrian and international galleries and art dealers present contemporary art, classical Modernism and design from the turn of the previous century to the present day at Art Vienna. 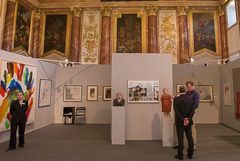 The art fair will be held at the Imperial Palace in Vienna from March 15 to 17, 2019. In the Liechtenstein Garden Palace, Art Austria shows the variety of Austrian Art from April 4 to 7, 2019. Works by artists who live and work in Austria will be on display.